Disasters such as hurricanes, tornadoes, earthquakes and even terrorist attacks are nothing new. However, today it is more important than ever to prepare. According to Borgen Project, the rate of climate-related disasters increased by 80% from 1980 to 2009. More people are living in densely-populated cities, which means that the devastation from disasters is worse. Even more worrisome is that, despite the increased risk of disaster, fewer people than ever seem to be prepared for disaster. 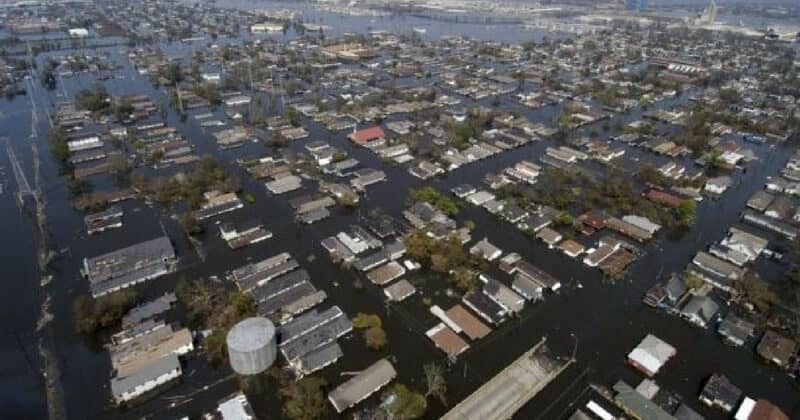 As one study on The Lack of Disaster Preparedness by the Public and It’s Affect on Communities found, most people believe that the risk for natural disaster is much lower than it really is. If disaster does strike, they believe that the government will bail them out (which recent major disasters has shown us is not the case). 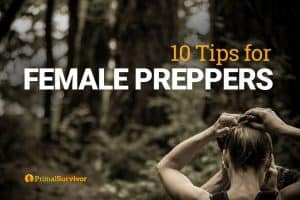 This guide is meant to help you with disaster preparedness so you can come up with a plan, know how to respond, and have all of the crucial supplies you need to be ready for any major disaster which may strike. As Huffington Post writes, you probably aren’t going to get hit by raining giant meatballs. While ideally everyone would prepare for all types of disasters from flooding to nuclear attacks, it is more important to first focus on the disasters which are most likely in the region you live in. At CNN, you can find a map of the riskiest places in America for natural disasters. At RSOE EDIS, you can find a global map of disasters. Another disaster which doesn’t get talked about much is long-term grid outage. A grid outage could occur because of an event like a solar flare, EMP attack, or terrorist attack. While not likely, a widespread grid outage — such as one which took out the electric supply of an entire state or the entire nation – would be devastating. According to former CIA director and spy Valerie Plame, an EMP event would wipe out modern life in America for 18 months! Thus, it is important to be prepared to live without electricity, running water, and other modern conveniences. The first part of your disaster preparedness plan is how you will stay informed about any events. With weather-related disasters, there is usually advanced warning. The earlier you hear about the event, the more time you will have to react. Emergency Radio: This is absolutely one of the most important disaster preparedness items to have. Choose an NOAA emergency radio which has an alarm that goes off if a disaster strikes your area. Read how to choose an emergency radio. Natural disasters like hurricanes and earthquakes can cause severe injuries and damage through broken glass, debris, and fires. Much of this can be avoided by knowing how to prepare your home for the specific disaster. In a tornado, it is best to go into the basement for safety or storm shelter. During an earthquake, the safest place is underneath a table or desk. It is important to learn this information and identify where you will go in case a disaster hits your region. Some cities have started preparing for disasters by putting up evacuation route signs like this one. 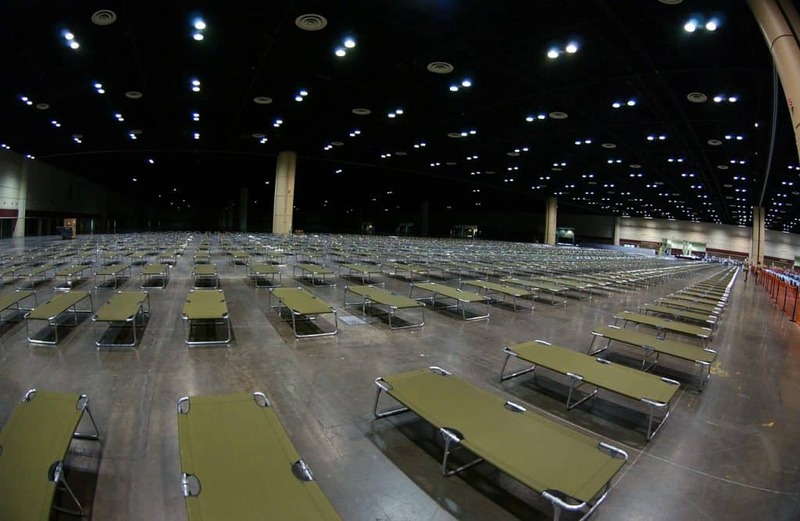 This image shows an emergency shelter set up for natural disasters. This is another aspect of disaster preparedness which often goes overlooked. As a result, many families are separated from each other after disasters. 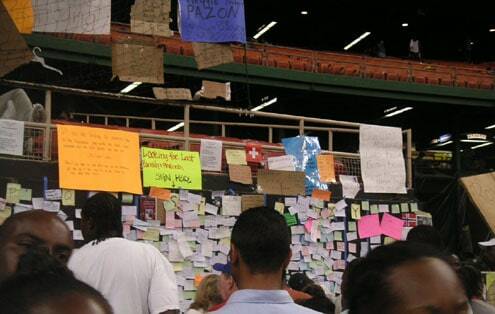 The image below shows a missing persons board after Hurricane Katrina. Many of these cases could have been avoided with a plan for what to do if disaster strikes while away. Make an Emergency Communication Plan: Cell phones often don’t work during emergencies. Thus, do not rely on your cell phone as a means of getting in touch with family members. Here is how to make an emergency communication plan. Know School Evacuation Policies: This will make it easier to get in touch with your children if they are evacuated from their school. Determine a Safe Place: In case it is unsafe to go home, determine a safe place to meet at, such as a relative’s home. Write Down Phone Numbers: Store important phone numbers (including the numbers of family members, the safe location, work, and school) someplace other than just your phone. Having these available in the cloud is one smart option, as is putting them in a waterproof binder. 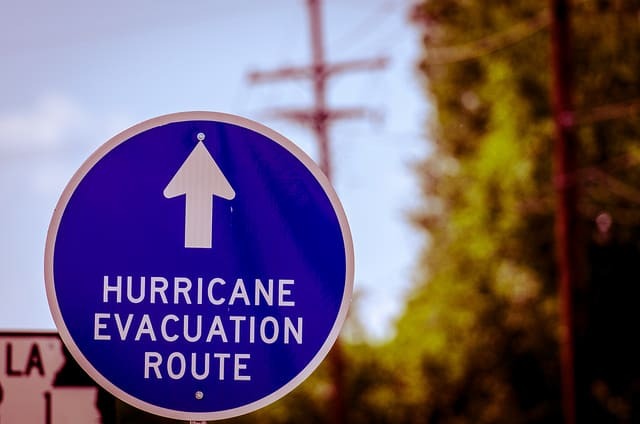 Keep Disaster Supplies Away from Home Too: These include having some basic supplies in your vehicle, work, school, or any other locations you spend a lot of time at. 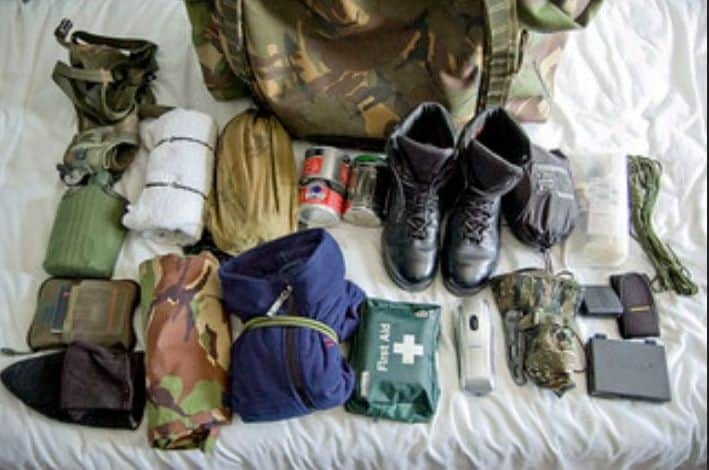 Make a Get Home Bag: Pack a survival bag which contains everything you might need to help you get home during an emergency. Here is a complete Get Home Bag checklist. A Missing Persons board which was used to help locate lost family members after Hurricane Katrina. Not only should you have a specific plan on what to do during a disaster, but you must also practice this plan. Running drills is a good way to mentally prepare for the disaster and ensure everyone knows what to do. During natural disasters, the water treatment centers often don’t work. So, even if there is running water, it may not be safe to drink. You must have a supply of clean drinking water. FEMA and the Red Cross recommend having at least 3 days’ worth of emergency water. 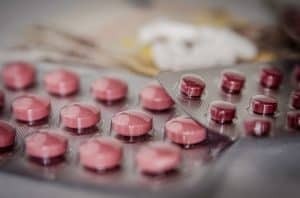 However, it is better to aim for a 30 day supply. You’ll need at least 1 gallon per day for drinking, cooking, and sanitation. 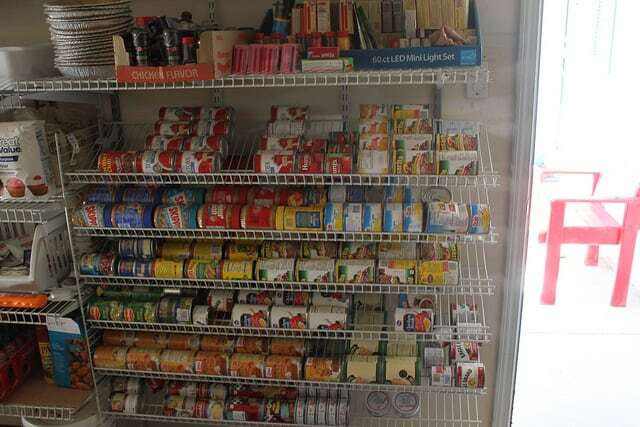 Emergency food should consists of foods which are non-perishable and well-sealed so they won’t be damaged by flood water or debris, and require little or no cooking. Consider that you may also need emergency food for evacuation. As with water, FEMA and the Red Cross advise that you have a 3 day supply of emergency food. 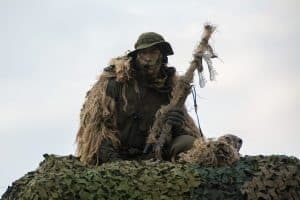 Many preppers aim for at least a 30 day supply as well as off-grid methods of cooking. Natural disasters almost always result in disease outbreaks due to hygiene threats such as sewage in flood water. To avoid the hygiene risk (in your home at least), it is crucial to have an emergency method of dealing with human waste. This aspect of disaster preparedness is often overlooked and to dire consequences! One of the cheapest, easiest, and most-effective solutions for waste management after a disaster is a two-bucket toilet system. 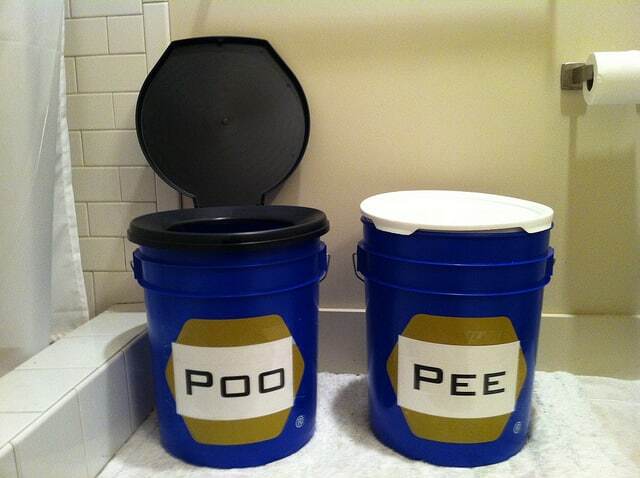 Read how to make a two-bucket toilet system. The two-bucket toilet system is a cheap, effective solution for disasters. During disasters, injuries from debris and flying objects are common. It isn’t always possible to get to the hospital, and hospitals are often overcrowded. Having a first aid kit at home could mean the difference between life and death. See this Complete First Aid Supplies Checklist. Don’t forget to have first aid supplies at your work, school, and in your vehicle as well. Supplies for boarding up windows and doors: such as plastic sheeting, boards, nails, duct tape, etc. As part of your disaster preparedness plan (as talked about above), you will need to know evacuation locations and routes. In addition, you will need to have an evacuation kit packed. This is also sometimes called a Go Bag or a Bug Out Bag. Don’t forget that you will also need a binder with all of your crucial documents. Without documents proving your identity, you might be refused shelter or services! If the situation is dangerous for you, it will also be dangerous for your pets. Never leave your pets at home if you must evacuate! They could starve to death or be injured. Abandoned pets after disasters can also cause problems when they form packs. 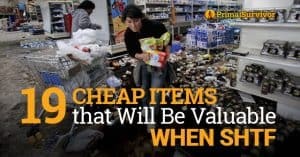 Having disaster supplies is a good first step, but you must also know how to utilize these supplies when it really matters. Further, there are always some aspects of disasters which can’t be accounted for. It is in these situations that disaster preparedness skills come in handy. Finally, remember that strength comes in numbers. 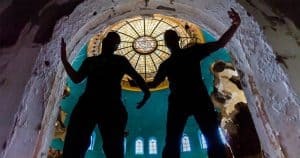 If your entire community is for disasters, then it is less likely that other problems – such as mass infection, looting, or rioting – will occur in the disaster aftermath. The Citizens Corps is one group which aids in community disaster planning. Find a Citizen Corps near you here. Are you preparing for disaster in any other ways? We’d love to hear from you in the comments! Do You Live in One of These Most Dangerous Places in America?